"This is an excellent video series for aspiring hyper turbo professionals" - Serkules, 2012 profit leader with over 1 million on winnings after rakeback on PokerStars. "Impressive! Perfect for anybody who is learning and playing hyper turbos. A solid extension of Mersenneary's teachings." - Zakwray/BOOMF, high stakes hyper turbo professional. "A very complete guide that covers all of the fundamental topics needed to start beating hyper turbo husngs. The series has a good format and the information is well chosen and well explained." - Betterways, $100-300 level hyper turbo professional. Member Wisher: "This is my graph since studying the Chadders0 pack. It was definitely worth it." - A second 36 minute video against a typical opponent, explaining and implementing strategies players use everyday to defeat their opponents. 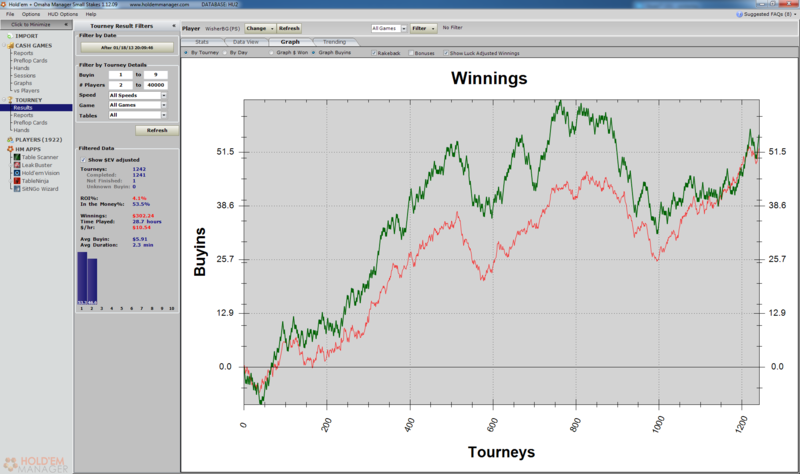 - A session review features Chadders 4 tabling hyper turbos. - An explanation of the impact of preflop frequencies on postflop play. - Concepts include 3betting, leading in limped pots out of position and focus leaks. - HokieGreg plays two tables on the Merge Network's super turbo structure. Note: Accounts and purchases are for one single person. Contact us with any questions about that policy.